Buy drum kits percussion or guitars online from Footesmusic in London. 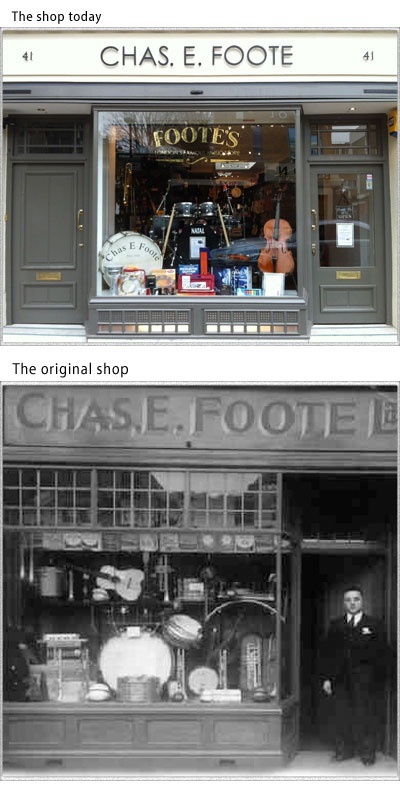 Chas E Foote was founded in Hornsey Road in 1920 by Charles Ernest Foote and today is still run for musicians, by musicians. It relocated to Soho in the 1930's and was bought by the Della-Porta family - the founders of Premier Percussion - where it sold instruments to the great and the good in various locations around Golden Square for the next 80 years. In 2012, Foote's was purchased by its long time Sales Director, Rob Wilson, with the financial help of a group of investors that include Pink Floyd's drummer, Nick Mason. Located in new premises in Store Street (link to map here) - just off Tottenham Court Road in bustling Bloomsbury - we are looking forward to celebrating Foote's centenary in 2020. We have on display the largest selection of Drums, Percussion and String Instruments in Central London. Our knowledgeable staff have a great passion for the instruments they play and sell and take pride in offering good customer service. We always recommend visiting the store to try before you buy, but if it’s online shopping you’d like for ease of ordering through a secure server and fast delivery too you've come to the right place. We deliver door to door across Europe and beyond.